An Open Sauce contribution here from Nigel Shardlow (apologies if you've sent me one and I've not posted it yet, I promise to get round to it very soon.) Many thanks Nigel, a textbook contribution. 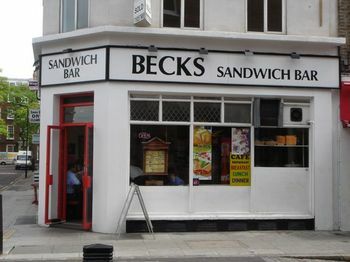 Becks Sandwich Bar is about halfway up, or halfway down, Red Lion street in Holborn, between Theobalds Road and High Holborn, just round the corner from where I sometimes work. I asked the guys in the office - lovely people, though perhaps a little over-fond of gourmet sandwiches made with Ortiz tuna, buffalo mozarella and pesto - if they had been there, and one of them said, "No, I've always found it too intimidating." I knew what they meant. 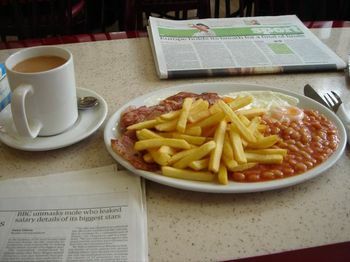 At lunchtime it's packed with serious people who know exactly what they want, and what they want is typically fried and served with chips and a cup of very strong tea. Tea that's brewed in a pot, not in the cup. Fans of EBCB have nothing to fear here. The decor is everything you'd expect from a great cafe: eclectic, colourful, no-nonsense. 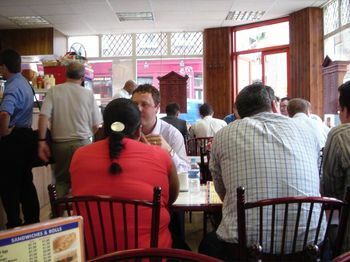 The waiting staff are all very busy today - lots of serious people looking for lunch. The tea was in front of me a minute after I ordered it: dark, tannic and strangely refreshing. The EBCB arrived four minutes later, in spite of the fact that they were almost full to capacity, as you can see. Plenty of room on the table to spread out the Guardian. It's the Champions League final tonight so everyone's got the paper open at the sports pages, checking the line-ups. 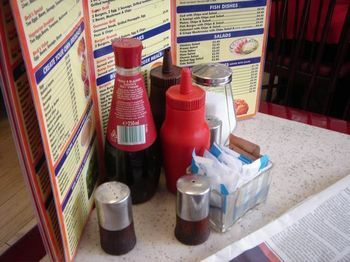 The condiments stand proud guard in front of the brightly coloured menus. Fearsome-looking little fellas. When I went up to pay at the end the proprietor was passing two cups of tea to the waiter. "These are for the customers over there", he said. "They are extra strong. Extra strong." I was in awe. Superbly written! And your photo's create hunger pangs. You have a wonderful future ahead of you extolling the delights of the EBCB. Full marks, well done...!! I've been reading your blog for well over a year and long to sample one the places you mention on my next trip to London with my English husband!!!! Disappointed to learn you read the Guardian. Do you realise bacon would be a no go in Madeline Buntings world ? "slightly scary vibe though, perhaps it was the St George's Cross on the wall"
Get with the times. Its now OK to be English and proud. Not racist, not imperialistic, but cool. See Ruth Kelly and Trevor Phillips. But I wont hold any of that against you. Great site. I love visiting every now and again. 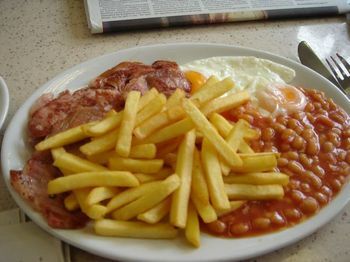 Egg,Bacon,Chips and beans. Bloody marvolous. Hey, this is a brilliant concept for a blog. :-) More like a travel guide on the web, only there are better reviews. Keep it up!